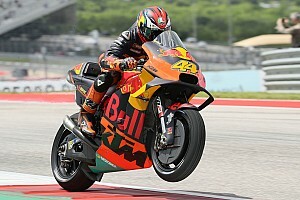 Red Bull says it hopes its sponsorship of the Tech 3 KTM MotoGP team will allow it to emulate the success it has had bringing up young talents in Formula 1 with Toro Rosso. Tech 3 has picked up the energy drinks company as a title sponsor as part of its transition from Yamaha to KTM machinery, and on Tuesday the team revealed a new livery for 2019 incorporating the same blue-and-silver colours used in F1 by Toro Rosso. 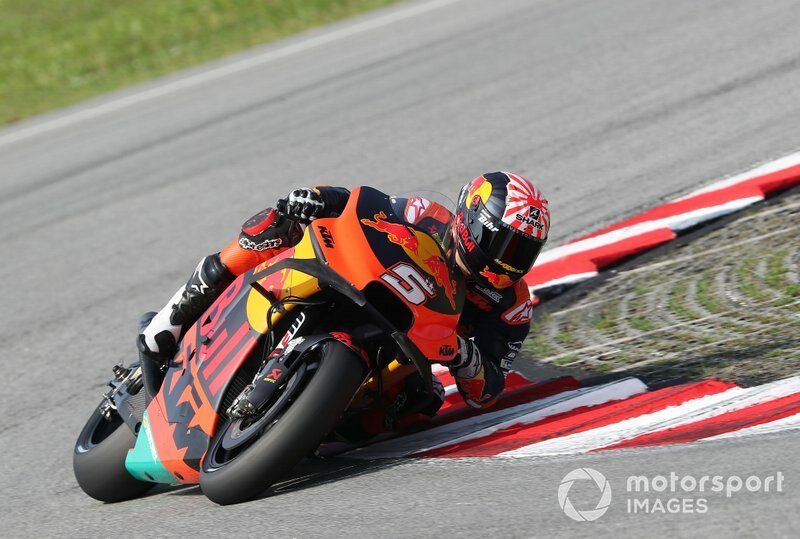 With Johann Zarco joining the factory KTM squad alongside Pol Espargaro, Tech 3 has recruited Moto2 runner-up Miguel Oliveira to partner Hafizh Syahrin for its first campaign with the Austrian marque. The new alliance also extends to Moto2, with Tech 3 switching from its own Mistral bikes to KTM machinery for 2019 riders Marco Bezzecchi and Philipp Oettl. 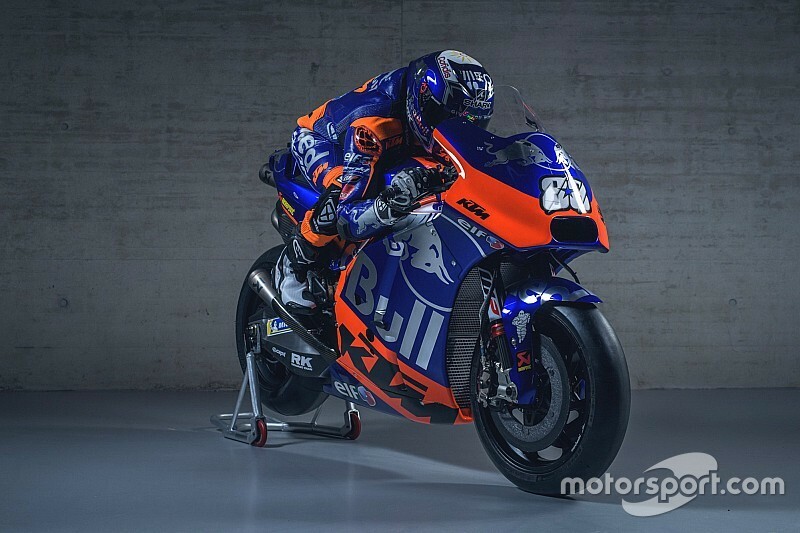 Speaking at the launch at KTM's Mattighofen base, Red Bull Motorsports Manager Thomas Uberall suggested the similarity between the Tech 3 MotoGP livery and the Toro Rosso F1 colour scheme was no co-incidence. 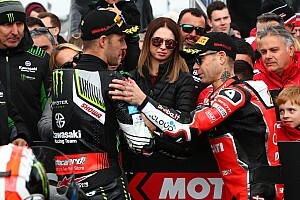 He added that he hopes riders will graduate to the main KTM team from Tech 3 in the same way F1 drivers such as Sebastian Vettel, Daniel Ricciardo and Max Verstappen have progressed from Toro Rosso to the Red Bull A-team over the years. 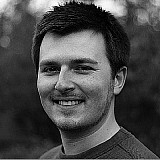 “I’m very happy to be there with two MotoGP teams,” said Uberall. “I have one who is fighting for podiums, I can say this because we did this already last year [at Valencia]. “And we have a second team where we can bring up the riders coming from very low [down the ladder], from [Red Bull] Rookies Cup, Moto3 and Moto2. 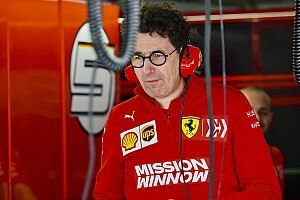 “They can have their first steps in MotoGP with less pressure than the factory team. This is really what we want to do, very happy for that. “We proved [the model] already on four wheels, and we do something almost exactly the same in MotoGP now. KTM CEO Stefan Pierer has set his team the goal of finishing inside the top 10 in its third season after a difficult sophomore campaign in the premier class. Last year, Espargaro finished the year 14th overall – despite missing four races due to injury – while Bradley Smith, who has moved on to an Aprilia test role for 2019, was a further four places back. Espargaro’s Valencia podium did however ensure KTM beat Aprilia to fifth in the manufacturers’ standings for the second year in a row. “It’s a five-year programme, and at the end we want to see podiums,” said Pierer. “For the upcoming season, I want to see single-digit ranks. I think that’s realistic. Zarco and Espargaro ended the recent Sepang test in 17th and 18th places on the final day of running.